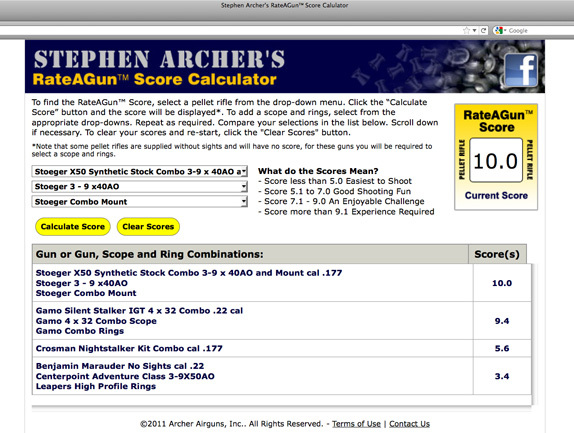 For those of you interested in choosing an air rifle that will give the most shooting fun at your own experience level, check out our site at http://www.rateagun.com There you will be able to compare a wide range of air rifles - with and without scopes - to see how they match your skill and experience level. The screen grab above shows how the calculator looks in use. It confirms that (for example) the Marauder/scope combination will be significantly easier to shoot than either of the Gamo or Stoeger combos, even though it's a more powerful gun, because it uses PCP rather than spring/piston power. Make your own comparisons and see what you think! 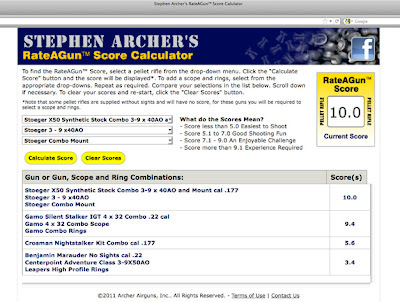 Our RateAGun calculator is easy to use and we have a huge range of guns there for you to see. And when you find that "perfect" air rifle, you can visit our ArcherPelletGuns store for more details and buy - if you wish.